Detailed Product Description Vacuum Blood Collection Tube (Black cap) Tube material: Glass or plastic Volume of blood draw (ml): 1.6/2.0/2.4/2.8/3.2/3.6/4.0/4.4/5.2/5.6/6.0/6.4/6.8ml Tube Spec. (mm): 12/13*75, 12/13*100, 13*55mm, 15/16*100mm Tube with black cap, called ESR Tube, with additive of 0.129mol/LSodium Citrate(1: 4). 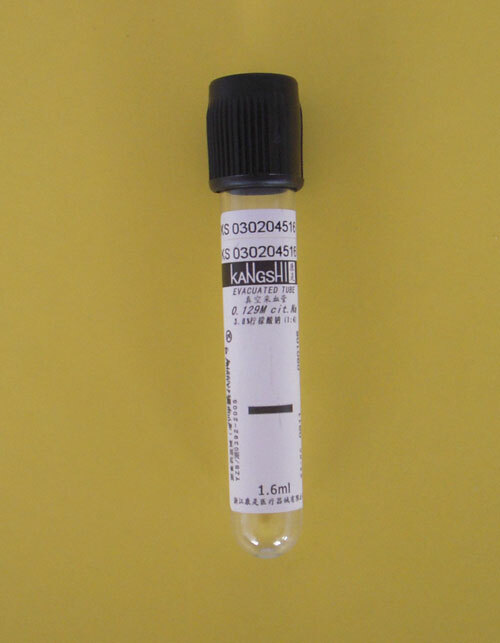 Widely used in blood collection and anticoagulation for sedimentation rate test. It contains a 3.8% buffered tri-sodium citrate solution (0.129mol/l) 1: 4 to blood. More Product Features Trademark: KANGSHI Model NO. : KS-NC4 Standard: ISO13485/ CE Productivity: 10000000pcs/month Unit Price/Payment: USD 0.07-0.13/pc FOB ningbo or shanghai Company: Zhejiang Kangshi Medical Devices Co., Ltd.